My interest in baseball began in the mid 1970s when, as a thirteen year-old, I wandered into my livingroom in time to see Hank Aaron break Babe Ruth's all-time home run record. I didn't get hooked that night but my awareness of the game was born. I was reminded of this wonderful game once again when I went to music camp in Oneonta, NY a few years later and "followed the crowd," as they say, to see the minor league Oneonta Yankees play. A few years after that the light bulb finally came on, and I began my "association" with Fran Healy, Frank Messer, Bill White and "The Scooter," Phil Rizzuto, the Yankee play-by-play announcers. He talked on the air sometimes about being a World War II veteran, once saying he was in the "naval cavalry." This got a huge laugh out of Bill White, who often teased him and was sometimes clearly annoyed by him. However, you could tell White was fond of his broadcast partner and was willing to put up with any of Scooter's antics. Then, of course, there were all the birthdays and wishes to listeners. He'd do these for innings at a time, getting way behind with them. One night he announced that he wanted to say hello to a bunch a kids at a sleep away camp, and that he had to do it quickly because the kids had to be in bed by 9:30. With mirth in his voice, Bill White interjected, "It's 9:37." Scooter tried to ignore him and continue with his greeting. White chuckled and said, "They've been sleeping for 7 minutes." He loved his canolis, those sinfully delicious Italian pastries. For years I had no idea what he was talking about, being a black girl from the inner city. Years later when I found out I felt like saying it was Scooter's fault that I was fat in my twenties. He also loved his "beautiful wife, Cora." He probably mentioned her in just about every single broadcast. I remember watching some interview show in which they did a segment about Scooter. They interviewed both of them and showed Cora in the kitchen making pancakes. It was clear that they were each other's best friend. Back in the '80s I used to stand outside the stadium after games, taking pictures of players and begging for autographs. 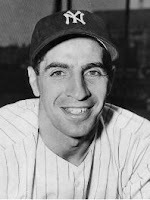 One day Phil Rizzuto came out. (Surprisingly, he hadn't left early that day!) As he walked to his car I called out "Scooter!" He looked at me and saw that I was holding my camera up to my face, ready to take his picture. He stopped, waited, and when I'd taken the picture he asked, "Ya got it?" I nodded, but I was so stunned I forgot to thank him! The picture didn't come out very good and I don't know what I did with it, but who cares? I'll always have that memory. Thanks Scooter, and rest in peace.